$60 or $150 for the 3 workshops in the series. 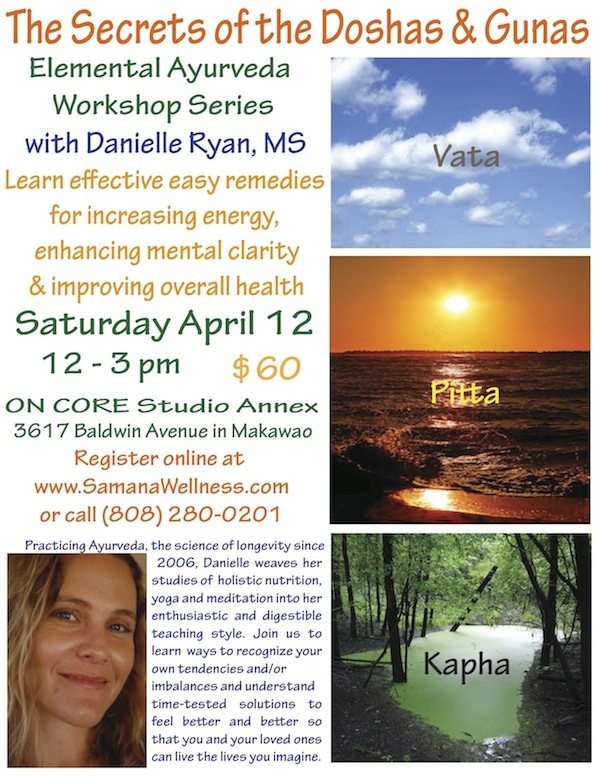 Join us for an exciting journey into the elements of Ayurveda beyond the doshas of Vata, Pitta and Kapha to the qualities (gunas) that make up everything that exists. Learn to discern the subtle differences that make us uniquely who we are, and the power of conscious awareness to shape our minds, bodies and souls. Whether you are brand new to Ayurveda (the Science of Life) or a seasoned practitioner, this elemental approach will offer you useful perspective and strategies for maintaining your own health and supporting others as well. Space is limited, so register to reserve your spot today!